Sweetener is the generic term for all sweetening substances. This group includes not only sucrose (sugar) but also monosaccharide like fructose and glucose. Honey for example also belongs in this category. These are primarily sugar alcohols (polyols) such as isomalt with special properties such as reduced calories. They are also gentle on teeth and suitable for diabetics. Sugar substitutes are bulk sweeteners. Essentially, the function of these is purely for sweetening and, because of their normally high sweetness intensity, are only used in small doses. For the most part, sweeteners are calorie-free and are often used in combination with other intense sweeteners. They are also frequently needed to sweeten polyols. The Acceptable Daily Intake (ADI) is the amount of a food additive that can be ingested daily with the diet, even during a lifetime, without an appreciable health risk on the basis of all facts known at the time. 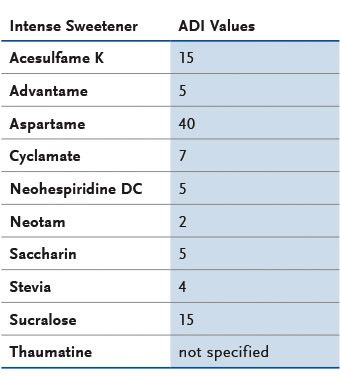 To determine an ADI all available toxicological data from scientific studies is reviewed. The maximum dietary level of the additive that is without demonstrable toxic effects is called the “No Observable Effect Level” (NOEL). This level is then adjusted by inclusion of a large safety factor – often 100 – providing a large margin of safety. The ADI values are recommendations and do not have legal status. They are taken into consideration during the rulemaking process by the legislator. The use of sweeteners in foodstuffs and pharmaceuticals requires legal authorisation. Before an approval of sweeteners as food additives they undergo extensive scientific tests, lasting up to ten years, which must prove that the amount of the additive that is expected to be consumed by humans is safe. The information on this site is subject to a disclaimer and a copyright notice. Ancient Rome: “SAPA”: Extraction from fermented wine which is heated and from which magnificant crystals seperate. 1914 – 1945: World War I and World War II and post war period: sharp rise in the consumption of Saccharin, it becomes a sought-after comodity because of the shortage of sugar. 1950: Abbott markets Cyclamate under the brand name “Sucaryl”.